Once the centre of the New York bohemia, one shop in the heart of Greenwich Village remains resilient to the encroaching gentrification: Carmine Street Guitars. There, custom guitar maker Rick Kelly and his apprentice, build handcrafted guitars out of reclaimed wood from old hotels, bars, churches and other local buildings. Nothing looks or sounds quite like a Rick Kelly guitar, which is the reason they are embraced by the likes of Bob Dylan, Lou Reed, Patti Smith, Jim Jarmusch, just to name a few. 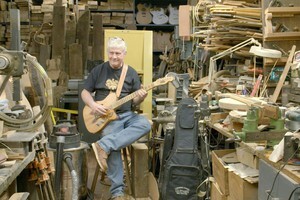 Featuring a cast of prominent musicians and artists, the film captures five days in the life of Carmine Street Guitars, while examining an all-too-quickly vanishing way of life. Ron Mann is one of Canada's foremost documentary filmmakers. Mann established his international reputation while in his twenties with a series of award-winning theatrical documentaries, including Imagine the Sound (1981), Poetry in Motion (1982), Comic Book Confidential (1988), Twist (1992), and Grass (1999). Ron’s other films include Go Further (2003), Tales of the Rat Fink (2006), Know Your Mushrooms (2008), In the Wake of the Flood (2010), Altman (2014) and Carmine Street Guitars (2018). Ron has also acted as executive producer on the documentaries Brakhage (1998), Examined Life (2008), Mighty Uke (2010), Lunarcy! (2012), Mermaids (2016), I Called Him Morgan (2016) as well as the television series Pure Pwnage (2010). In 2002, Ron also founded FILMS WE LIKE, a boutique distributor of documentary, independent and international films in Canada. "The most unassuming, sneakily beautiful, goddamn treat of a film I have ever seen." "A gentle, warm, immensely satisfying portrait of a West Village institution"